This is a beta version of the Holderness Biomass website which is still undergoing final testing and data validation before its official release. In some cases data may be inaccurate or missing, and this is being addressed by the controls contractor at the biomass plant. Located in Plymouth, NH, Holderness School is a college preparatory high school with a commitment to sound environmental practices "for the benefit of humankind and all of God's creation." 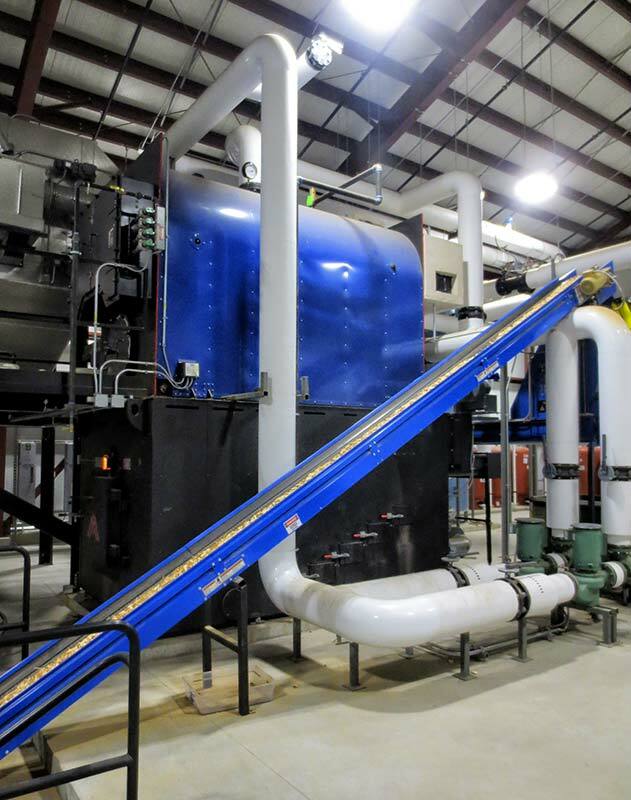 With the help of a $300,000 grant from the New Hampshire Public Utilities Commission's Renewable Energy Fund, Holderness broke ground in fall 2014 on a district heating system utilizing renewable biomass fuel. The system went into operation in summer 2015, and final commissioning took place in the winter of 2015-2016. This system reduces the school's dependence on fossil fuels and supports the local economy while producing inexpensive heat for the entire campus. The locally sourced woodchip fuel is a byproduct of sustainable timber harvesting and environmentally sound forest management. Holderness formerly used a central steam boiler plant fired on fuel oil and propane. The new biomass boiler system will incorporate two propane boilers for backup and reduces yearly fossil fuel usage by 111,000 gallons of fuel oil and 10,000 gallons of propane, saving the school approximately $300,000 in avoided fuel costs. The use of locally sourced biomass fuel will protect Holderness from volatility in the fossil fuel markets while keeping over $127,000 per year in the local economy. Unlike many renewable energy projects which must sacrifice economic gain for the sake of environmental stewardship, the new heating system at Holderness makes sense for the school's bottom line. Taking into account project financing, operation, maintenance, and fuel costs, the new heating system will result in net savings compared to the previous fossil fuel system over the next several years. The project included construction and installation of a woodchip storage bunker, a fully automated fuel handling and screening system, a 5.0 mmBtu/hr woodchip advanced combustion unit and hot water boiler, and an electrostatic precipitator (ESP) for emission control. A hot water thermal storage tank improves system efficiency by absorbing peak loads to allow for steady firing. A new hydronic distribution system connects to all buildings on campus. The woodchip system provides real life study opportunities for the school's environmental science curriculum and sustainability programs. The system serves as an example for the community that responsible environmental practices result in tangible economic benefit, and will assist New Hampshire in meeting its goal of 25% renewable energy by 2025. The USDA Forest Service Northeastern Area Wood Education and Resource Center in cooperation with the North Country RC&D provided a grant to support the development of this website. The website provides access to the rich operational data for a modern wood-fired district heating system collected by Holderness School on their campus. Through a dynamic graphical display of energy usage on a campus map, to a schematic representation of the boiler plant with overlay of real-time data, the website provides insight into the design of this modern biomass heating system. All historical data is permanently stored and can be retrieved in spreadsheet format for further study. The website also provides some basic calculations of key system metrics for use in discussions with students and general public: system efficiency, and energy usage by building.